The PJTSAU has already started conducting admissions to post-graduate courses in agriculture through national-level exam conducted by ICRISAT. 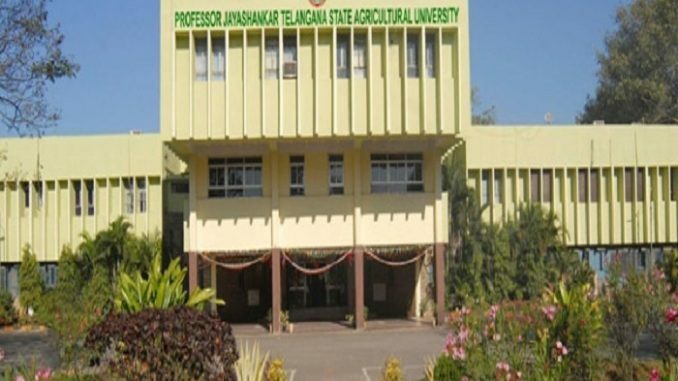 HYDERABAD: Hyderabad-based Professor Jayashankar Telangana State Agricultural University (PJTSAU) has been ranked the sixth best agricultural university in the country by the Indian Council of Agricultural Research (ICAR) in its recently-released ‘Ranking of Agricultural Universities 2018’ that includes ranking for agriculture, veterinary as well as horticulture universities. The rankings also highlight the pathetic condition of PV Narsimha Rao Telangana State Veterinary University, headed by animal husbandry department secretary Sandeep Kumar Sultania as in-charge vice-chancellor, and Sri Konda Laxman Telangana State Horticulture University, headed by agriculture department secretary C Parthasarathi as in-charge VC. PVNR Telangana State Veterinary University has been ranked 60th out of 63 universities and research institutes whereas SKL Horticulture University was not even considered for ranking. PJTSAU experienced a leap in this year’s ranking from 12 last time. In the National Institutional Ranking Framework (NIRF) by the Union ministry of human resource development released earlier this year, PJTSAU was ranked 82 and was among the only four universities from Telangana among the top 100 universities in India, above the IIIT-Hyderabad that was ranked 98. With common entrance test, NEET, for MBBS now being held nationwide, PJTSAU vice-chancellor Dr V Praveen Rao, speaking to media on Friday, said that he, being a member of the governing board of ICAR proposed that admissions to undergraduate (UG) agriculture courses should be made through a national-level entrance exam on the lines of NEET for MBBS. The PJTSAU has already started conducting admissions to post-graduate courses in agriculture through national-level exam conducted by ICRISAT .